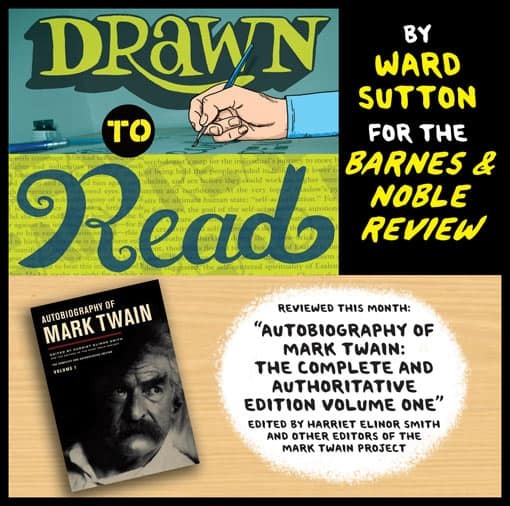 We just came across Ward Sutton‘s remarkable illustrated review of the Autobiography of Mark Twain in the Barnes & Noble Review’s monthly Drawn to Read column. 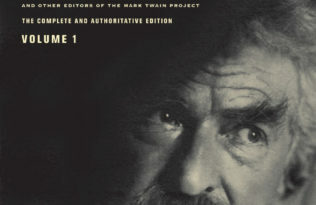 Through witty graphic representation, Sutton recreates some of the highlights from Twain’s Autobiography, such as his views on patriotism, his brush with dueling, an awkward encounter with Ulysses S. Grant, and his feelings about a lawyer who cheated him (“I have no harsh words to say about him. He is a great fat good-natured, kind-hearted, chicken-livered slave…”). We also learn that Mark Twain considered the form of his book “one of the most memorable literary inventions of the ages. … It ranks with the steam engine, the printing press & the electric telegraph.” Well, no one ever accused the man of having low self-esteem. Check out the full review, and peruse other Drawn to Read columns at bnreview.com.